Cookery Bits: Fruit salad yummy yummy ! Childhood friends…ahhh, they are memories to cherish! The laughter, the adventures, the naughtiness, the experiments, the tussles and compromises, all that we did together…won’t such bygone memories bring smile on your face? We grew up and went to new places, made new friends; but still… there is always a special place for an earlier-day friend, that has no substitute. There were periods of time in my life where I couldn’t blend with new acquaintances and grieved for some of my old friends! But what is the connection with fruit salad and an old childhood friend? Well, this is the dessert that I grew up with. A Christmas, Easter or any other celebration without a fruit salad was unimaginable. A packet of Brown & Polson custard powder was a permanent tenant in the fridge! When I flew first time to USA after marriage, I took a packet of Brown & Polson, thinking custard powder won’t be available :D! Today in Australia, amidst a multicultural society numerous of varieties of desserts are available. But… nothing can give me the comfort and smoothness, a bowl of homemade fruit salad gives! Cut fruits into small pieces and mix all together with sugar and refrigerate. Mix custard powder with a little milk to make a smooth paste. Mix sugar and rest of the milk and bring to boil. Pour the custard powder paste to boiling milk. Stir well continuously till the mixture is thick. Remove from fire and allow it to cool and refrigerate for at least 4 hours. In a dessert bowl place some fruits and over that pour two dollops of custard. Garnish with glazed cherry and serve. N.B – I used ready-made pouring custard from supermarket instead of making it with custard powder. Congrats on ur 50th post...Awesome Click on fruit salad..
Omg, that bowl of salad looks sooo inviting and colourful, congrats on ur 50th post.. Many congratulations on your 50 the post and many more to come.The fruit custard truly makes up for this occasion and it looks so festive too,liked the pictures and the spoon with the red ribbion-Cute :)!!! Congrats on your 50th post..Fruit salad looks so yummy. 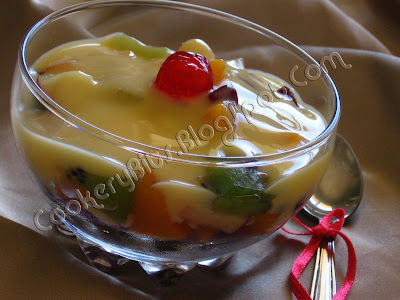 Hi,you hav surprise waiting in my blog plz visit...Yummy fruit salad! That bit about the 'Brown & Polson' is so endearing...something like Maggie or even Dairy milk chocolate!!!!! Delicious Fruit salad and a nice click!!! first time here,,u hv a awesome n wonderful blog..
salad looks mmmmm mouthwatering.n congrats on ur 50th post. do drop by my blog too.. I'm a Home Chef !! !